under the "opts" menu, at the top of the "About Orrery / Symbol Key" page. but does use the GPS information, by querying gpsd. that stack. The program works with 2008.x too. that stack. The program works with SHR, OM2009, OM2008.x, etc. too. introduced by the Transverse Mercator projection. symbolic representations of the solar system objects. The orrery has two control modes, "finger mode" and "stylus mode". the compass will disappear, and the display will be redrawn. tapping the green arrows at the bottom, or the green azimuth values. are displayed. Tapping anywhere else toggles between the two screens. The opts menu allows you to toggle between finger and stylus mode. active for the current session, but does not save to flash. on New Year's Eve, 2009.
a city, few meteors will be seen even during a shower. year is not a good one to observe that particular shower. dark sky hours to expect tonight. In this context, "tonight"
or the current night, if the sun is below the horizon. simply change in year using the time menu. 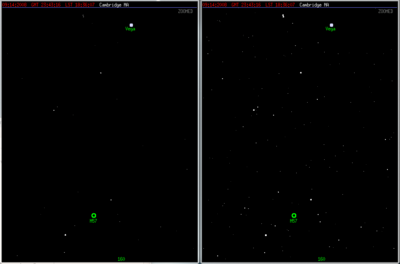 orrery program currently does nothing with the visual magnitude, but future versions may use it. meteor showers which are now occurring will be plotted. shower maximum - see the Meteor Showers page for more information. The radiant position usually changes as the shower progresses. The orrery takes that into account when plotting the radiant. measurement systems still in use today. eyesight located in a very dark area on a moonless night can see. will be the default the next time orrery is run. directly facing it at the time indicated by the display. things. This is a bug. NOTE: the current version is 2.7. [http://projects.openmoko.org/projects/orrery/ orrery area of the gForge site]. The orrery is gtk based. 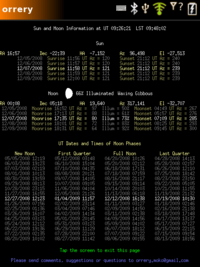 Monthly moon calendar now uses moon images. and the number of dark hours, is shown. for the next or current night. The "items"
radiants for currently active showers. background stars as the shower progresses. as to use GNU autotools properly. which uses a comma for the decimal point. call up the azimuth compass. moon calendar to change months. Please note: Some websites have links directly to the .ipk files for this program. While it is very gratifying that other people like the program enough to include a link to the .ipk file, those links will not automatically update when a newer .ipk file is uploaded. So using one of those links might cause you to install an obsolete version of the program. If your version of the code doesn't match the description below, please download the most recent version from here. 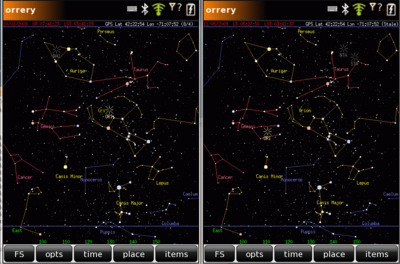 The current version is 2.7, and the version is shown under the "opts" menu, at the top of the "About Orrery / Symbol Key" page. The orrery is a simple open-source application for the Openmoko platform which displays the night (and day!) sky. It is nowhere near as elaborate as, for example Google Sky or xephem. It is intended to be a small application that will have a storage footprint comparable to a ringtone, or one of the games bundled with the openmoko rootfs. It requires no network connection, but does use the GPS information, by querying gpsd. Note, the screen grabs shown below were taken with the orrery running atop the 2007.2 stack, because I find it easier to do a screen grab with that stack. The program works with SHR, OM2009, OM2008.x, etc. too. 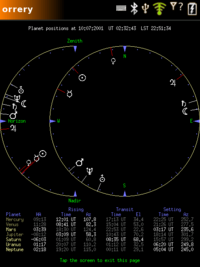 The user may chose to have the program display the stars visible at the user's location and at the current time, or at any other position on the earth, or any other time between 3000 BC and 3000 AD. There are two sky display screens defined. By default, one of them shows the display shown above, and the other shows the constellations, and symbolic representations of the solar system objects. The constellations are plotted in three colors. The twelve zodiac constellations are plotted in hot pink. The constellations plotted in gold are the classical Greek constellations, as listed in Ptolomy's Almagest (apart from the zodiac constellations, which are also in the Almagest). 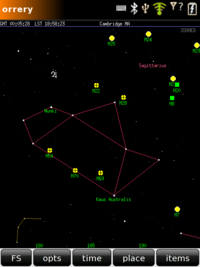 The only constellation from the Almagest which is not plotted is Argo Navis, which is not one of the official modern constellations (Argo Navis was broken up into the modern constellations Carina, Puppis and Vela). The remaining constellations, plotted in blue, where added during the last few hundred years. 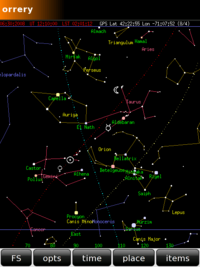 There are many informal constellations which are widely known, such as the Big Dipper, The Summer Triangle, etc. 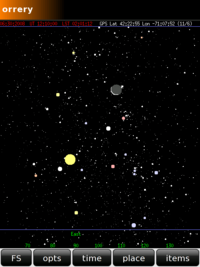 The user can choose to display some of these unofficial constellations by selecting "Use Asterisms" from the "items" menu. If you know of some nice asterisms that the orrery does not yet display, please send them to orrery.moko@gmail.com, and I'll include them in a future release if I can. 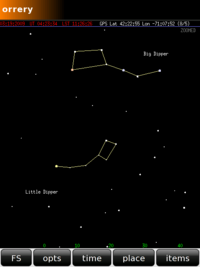 The image below shows the Big Dipper and Little Dipper asterisms. The image can be panned by tapping your finger in the bottom 1/5 of the display (excluding menus). The size of the panning step is controlled by how close your finger is to the edge of the display. If you tap in the center, it pans by 0 degrees, and nothing happens. If you tap near the left or right edges, it pans by the maximum allowed amount, +-45 degrees. Pan steps are quantized in increments of 5 degrees. 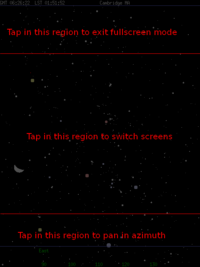 You may exit fullscreen mode by tapping anywhere in the upper 1/5 of the display area. Tapping anywhere else toggles between the two screens. You may use your finger or stylus to select another center azimuth. Keep you finger pressed to the display as you select your new center azimuth - the selected azimuth will be shown by a white pointer on the inside of the compass circle. 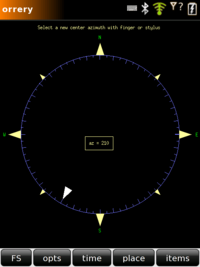 Once you release pressure on the screen, the compass will disappear, and the display will be redrawn. 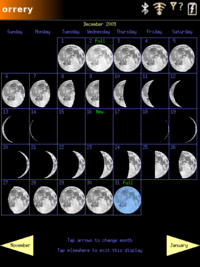 The This Moon's Moons page shows the phase of the moon for each day of a particular month. By default, the current month is shown, but one may use the arrow buttons to pan through the months. 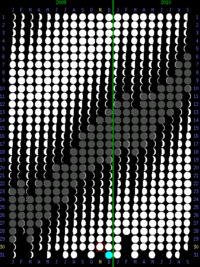 Both moon calendars show "Blue Moons", which are (according to the most commonly used definition) the second full moon in a calendar month which has two full moons. Both images above show the Blue Moon which falls on New Year's Eve, 2009. 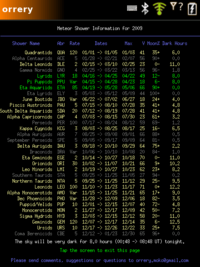 The items shown on the Meteor Showers page are 1) The name of the meteor shower 2) the abbreviation used for this shower when its radiant is plotted on the sky display 3) the expected number of meteors per hour - this is the maximum you will see under the best circumstances with a very dark sky and the shower radiant directly overhead on the date of the shower maximum. If the rate entry says "Var", that means the rate is variable; such shower are not apt to show a large number of meteors per hour. 4) the range of dates during which the shower will occur 5) the date at which the shower shows the maximum number of meteors 6) the typical velocity of the showers meteors in km/sec - larger numbers lead to brighter, bluer meteors 7) the percentage of the moon's disk which is illuminated on the date of shower maximum - full moon = 100%. A minus sign following the percentage means the moon is waning, a plus sign means it is waxing. Moonlight greatly interferes with seeing meteors 8) the number of dark hours on the date of the shower maximum - defined as the time during which the sun is more than 12 degrees below the horizon, and the moon is far enough below the horizon to not appreciably brighten the sky. If you use the GPS position feature, the number of satellites tracked, and the number of satellites used for the most recent position fix will be shown on the top text line (after the longitude and latitude). Note that the orrery only checks for a new position once every one minute by default, so you might have a fix with, for example, tangogps before the new position is displayed on the orrery. You can force the orrery to look for a new position by forcing a screen redraw. If the gps unit stops producing new position fixes, the most recent fix position will be used, and the word "stale" will be displayed next to the longitude and latitude. 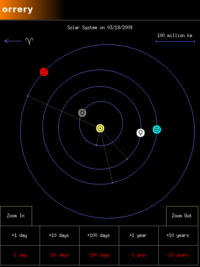 The magnitude scale for expressing the brightness of stars and planets is explained here. It is one of the oldest measurement systems still in use today. By default, the orrery displays every star a person with excellent eyesight located in a very dark area on a moonless night can see. If your observing conditions are less ideal than that, it can be helpful to use the "Mag. Limit" field in the item menu to lower the limit of the faintest object plotted. The plot below shows the "Summer Triangle" region plotted with the default 6.6 limiting magnitude on the left, and a 5.0 limiting magnitude on the right. The solar system symbols, used by default on the constellation page (screen two), are the standard astronomical symbols for these objects. They are explained here. Once the new catalog and softlink are in place, the orrery will allow you to change the maximum magnitude (using the item menu) all the way up to magnitude 9.0. Note that the default, smaller catalog is still used if the maximum magnitude is no larger than 6.6, so you may used the orrery with the faint star catalog, and not incur and performance penalty as long as you restrict yourself to stars no fainter than 6.6. The faint (mag > 6.6) stars cannot be displayed in constellation mode. 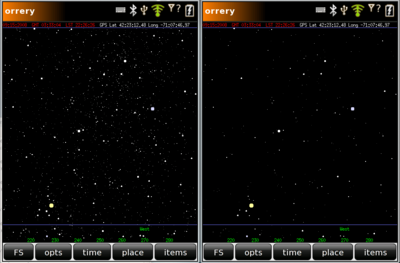 The default orrery star catalog contains 9931 stars. hipparcos_9.0.dat contains 83392 stars, and is complete to 9th magnitude. The orrery will be more sluggish if you choose to display stars fainter than 6.6. If you choose to display all the stars in the hipparcos_9.0.dat, by setting the magnitude limit to 9.0, it will take about 10 seconds to draw the star map. The plot below shows Lyra with limiting magnitudes of 6.6 (left) and 9.0 (right). This program has been tested running atop the 2007.2, 2008.x and SHR distributions. The only stacks it will definitely not work on are Android, Qtopia, and their descendants. 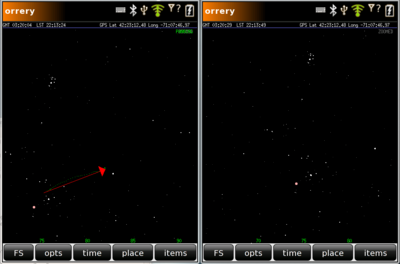 The orrery is gtk based. .ipk files for this program are now available for both the 2007.2 and 2008.8 stacks, at the gForge site. It is much easier to install than it used to be. The latest .ipk files can be found here. The Orrery program works poorly when the phone's display is in landscape mode. The reason this has not been fixed is that the sky projection used, Transverse Mercator, does not work well with the landscape aspect ratio; there is too much distortion at the edges. The fix for landscape mode will require using a different projection in that orientation. It's on the todo list. Please note: Some websites have links directly to the .ipk files for this program. While it is very gratifying that other people like the program enough to include a link to the .ipk file, those links will not automatically update when a newer .ipk file is uploaded. So using one of those links might cause you to install an obsolete version of the program. If your version of the code doesn't match the description below, please download the most recent version from here: . 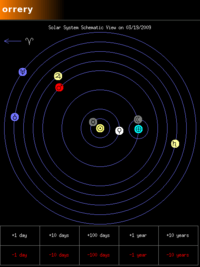 The current version is 2.6, and the version is shown under the "opts" menu, at the top of the "About Orrery / Symbol Key" page. You may use your finger or stylus to select another center azimuth. Keep you finger pressed to the display as you select your new center azimuth - once you release pressure on the screen, the compass will disappear, and the display will be redrawn. 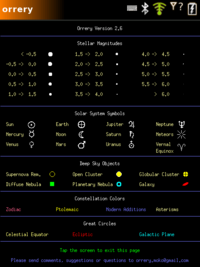 The default sky catalog used by the orrery contains every star you can see with your unaided eye, even if you have exceptionally good eyesight, and are located in a very dark area on a moonless night. 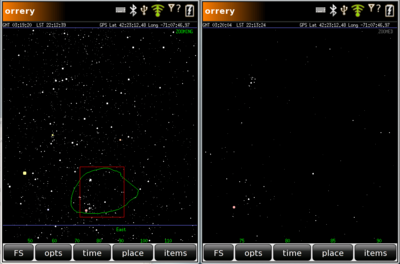 If you wish to display stars which require binoculars or a small telescope to be seen, you can download the file hipparcos_9.0.dat from the orrery area of the gForge site: . for the next or current night. The "items"
This page was last modified on 10 January 2010, at 19:58. This page has been accessed 113,527 times.